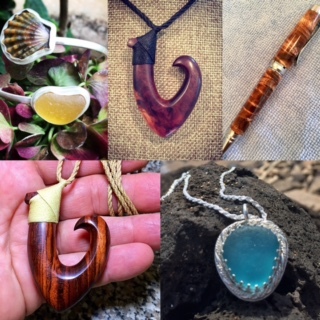 Offering beautiful, handcrafted custom jewelry, exotic hand turned Koa wood pens, and hand carved traditional Fish Hooks. 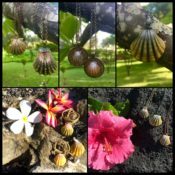 You are guaranteed to receive a unique, one of a kind gift made from authentic woods, naturally tumbled sea glass and Sunrise Shells all found on the island of Kauai. We are Mike and Michelle McCosh, a husband and wife team who were inspired by this beautiful island to create what we feel are one of a kind treasures that you can cherish for years to come. We hand select all of our materials. The pens and traditional Hawaiian Fish Hooks are made from local tropical woods, such as Koa, Mango, Kauila, Tamarind, Lama, Milo, Macadamia, Autograph, and Java plum to name a few. Koa wood is indigenous to the Hawaiian islands. Mike takes pride in learning the history behind each type of wood he works with. It allows him to share this history with potential buyers, thus making it a more meaningful, cherished gift from the island. He also utilizes a special finishing technique that is unique and helps to preserve the beauty of the wood for years to come. Necklaces, earrings, and rings are created using naturally tumbled sea glass found on the shores of Kauai. Hours and hours of beach combing have allowed Michelle to create pieces using some of the most rarest colors and designs in sea glass jewelry. The Sunrise Shells are equally unique and native to the Hawaiian islands. Color selection, quality of the shells, and unique design are all important factors when creating these beautiful pieces. All products can be found at the Luau Kalamaku located at the Kilohana Plantation in Lihue, where Mike and Michelle are vendors.